In addition to observing the Galilean moons it is quite possible to observe the most prominent cloud bands. 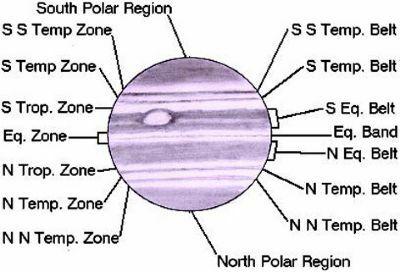 As shown below, there are several distinct belts and zones to view. Belts are reddish brown coloured, and the most obvious ones are the North and South Equatorial belts, along with the North and South Polar Regions. Jupiter’s atmosphere is dominated by hydrogen (89.8%) with the rest made up of helium and traces of methane, ammonia, water, ethane, acetylene, and propane. 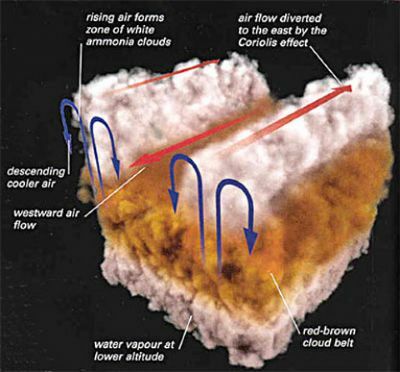 It is the mixing of gasses that gives rise to the different coloured clouds we can observe in the upper atmosphere. The planet’s famous Great Red Spot (GRS) is an enormous high-pressure storm that was first sighted from Earth over 340 years ago and it transits the central meridian of the planet just less than every 10 hours. The GRS is also featured in the opening image and can seen to the lower right. It is not particularly red at the moment, more a pale tan colour, and the colour does vary quite a lot over the years. Although it is Jupiter’s most impressive storm system, it can be difficult to discern initially but after the first confirmed observation it is much easier to find on subsequent occasions. Try a light-green filter (Wratten No. 56), which accentuates red features, to help the GRS stand out. Click here for another utility from Sky & Telescope, whichallows you to calculate the time the GRS transits the central meridian of the planet and helps you plan your observing activities. Larger scopes allow you to see more detail and differentiate some of the lower contrast features. There are colourful latitudinal bands, atmospheric clouds and storms, dynamic weather systems, and cloud patterns that change with hours days and, not forgetting, festoons. Take time to look for and study white ovals and dark ovals – these are white cloud tops and 'downdraft cyclones' respectively. If you closely examine the white zones between the belts you can sometimes see curving dark wisps called festoons. These are streaks of swirling gases intermixing rapidly in the turbulent equatorial zones of Jupiter. They can be seen clearly in the high-resolution Cassini opening image. They are perhaps one of the hardest to detect features on the face of Jupiter, but are very dynamic and rewarding to observe or image. light blue: enhances white features and details in orange and purple belts. Jupiter is low in the sky so you will be limited in the magnification you can use. The steadiness of the night air will determine how much magnification you can effectively apply and if the stars twinkle and dance you will not be able to see much detail. Best apply lower magnification and gradually increase it until the detail breaks down then revert to the last successful eyepiece combination. Larger aperture telescopes tend to suffer more from these effects of 'bad seeing', so if you have a choice on the night, consider using a scope of 8 inches aperture or less. Of course, larger apertures show more detail when the seeing is good, so there is a fine line to tread here. If you use a reflector telescope take time to check it is properly collimated. This will give you the best chance to view details during periods of good seeing and use higher magnification. Let your scope cool down to ambient temperature otherwise the image will appear to 'boil' due to warm air in your telescope tube distorting the image. For those of us who enjoy recording their observing experiences using CCD and digital imaging it will prove very difficult for the reasons mentioned above. However, “never say never,” and feel free to prove this author wrong by submitting your successful images to this website. Shown to the left are two examples of the author’s work, made using a 200mm Schmidt Cassegrain and a digital camera. They are also shown on the Image Gallery, and we would like to see more images join them! It can still be cold on these spring nights so dress warmly to ensure your observing experience is not marred by extreme discomfort. Jupiter is a wonderful planet to observe and study. It is forever changing and successive nights viewing will reveal the secrets of this dynamic giant of our Solar System. Enjoy your experience. Weasner’s Meade ETX Site Observing the Planets - Part 2: Taking on the Mighty Jupiter with the ETX and LX Telescopes.